This morning, we had the distinct honor of welcoming Dr. Leana Wen to Park as our 2018 Resident Scholar. Dr. Wen is the Commissioner of Health for the City of Baltimore ­— but only for a few more weeks as she will soon take on the role of President of Planned Parenthood. An emergency physician and patient and community advocate, Dr. Wen leads the Baltimore City Health Department (BCHD). BCHD’s responsibilities include maternal and child health, youth wellness, school health, senior services, animal control, restaurant inspections, emergency preparedness, STI/HIV treatment, and acute and chronic disease prevention. Dr. Wen addressed the Upper School in assembly, speaking about her experiences as an immigrant, as an emergency room physician, and as the Commissioner of Health for Baltimore City. She encouraged students to find their passions and to follow them – and to do it now, noting that this is a critical juncture in our history. She encouraged students to challenge themselves – find a need in the community and let that fuel advocacy work, just as she did as a physician, growing increasingly frustrated with a failing healthcare system. 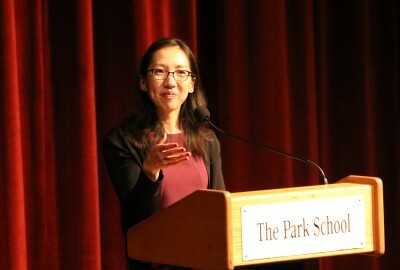 Upper Schoolers were then invited to ask questions, which our students did thoughtfully and passionately – questions ranging from Dr. Wen’s opinion on access to healthcare for all, to the effects of lead on developing children, to biases in the workplace, and to her hopes for her future as President of Planned Parenthood. After assembly, Dr. Wen’s Special Assistant Emily Mediate held smaller group sessions with students to further discuss the work of the BCHD and to answer additional questions. We are grateful to Dr. Wen and to Ms. Mediate for joining us this morning, and to the Parents’ Association for continuing to sponsor this important event for our students, as they have for more than 30 years.